We just got back from Rinpoche’s residence. I showed him the pictures of the Great Stupa of Dharmakaya built in memorial of Chogyam Trungpa Rinpoche in Colorado. We talked about construction detail. Rinpoche found this Stupa impressive. He drew our attention to the beautiful dome/vase in particular. He remarked that the Tara Great Stupa would be larger and more complicated with four decorated doors/shrines for each level. We asked Rinpoche to tell us his life story. But he said he’s just an ordinary man with flesh and blood. He’s just someone who eats tsampa and has to relieve himself. He said many people have asked to write his life history. But he kept refusing. He said his personality was like this. Even his son commented that Rinpoche was strange because he liked to put himself low. Anyway, due to a famous Bon historian Tsering Thar’s insistence, Rinpoche has written a summary of his life history in 3 days. He would find this text and give it to us. He emphasized that to write his life as it truly happened was a difficult task because it might stir up some problem. Rinpoche was imprisoned for 21 years as we all know. He’s a real Bodhisattva. Without any resentment, he transformed the prison cell into a Dzogchen retreat cabin. When he was imprisoned, he was only 20 or 21 years old. He related a beautiful and funny story to us. His Holiness the Dalai Lama once asked him how happy he was in prison. He answered that there’s no prison in the world that makes people happy. Prison is a place of suffering and this applies to all prisons both in China and elsewhere. 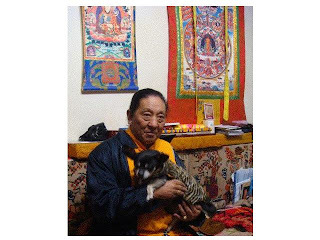 Rinpoche’s father, Hungchen Drotu Lingpa passed away 2 years before the imprisonment. At that time, Rinpoche was in a retreat with all the doors and windows closed. But as an only son he had to leave his retreat to take care of his father’s funeral. We also talked about his sister, a great female yogini and lama of our time. She’s the real kandroma (dakini). There are so many interesting things about her. I hope one day this can be revealed to others. Regarding the work for our Great Stupa, we decided that it would be best to start working now on the four images to be placed inside the main hall. Detail on this I’ll relate in the next message. Then somebody called at 10 pm. Rinpoche had to go to see a patient immediately. He said it might look as if he were just sitting all day at home. But in fact he had so much to do that he hardly found time to write. Please send all my best regards to Rinpoche. Please tell him that I also take his picture of Amitayus to Oxford. May the Buddhas bless the King for health and longevity!